Merthyr Town were denied promotion to the Southern League Premier Division after being beaten at home by Paulton Rovers. Nick McCootie scored two goals in the second half secured victory for the visitors. McCootie scored the opening goal from close range following a corner and added a second from the penalty spot. The Martyrs reached the play-off final following a 5-3 semi-final win over Swindon Supermarine. The Welsh side finished the regular season as runners-up to Cirencester Town in Division One South & West while Paulton finished fourth. 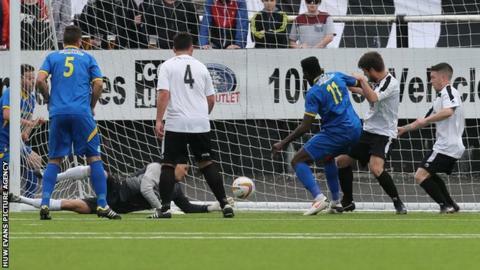 It was the second successive season Merthyr had lost in the play-off final. "It's disappointing that the only game we haven't scored at home was in the play-off final. We've come up short - last year and this year. "We weren't brave enough in key areas and we played safe. It was just one game too many for them. "As a group we weren't good enough so we've got to reshuffle the pack and hopefully bring in some new faces, have a clean slate and have another go."